It has rained nearly every day for a week. I have had some projects around the house that have been on hold. I still don't have the fence panel screwed to the post. I have the materials to start the garden pond, but I can't do that until the fence is finished. I still have shutters from a window that needs to hung up. None of this can get done with the rain. I finished Ace of Cakes, and 1 season of The Next Food Network Star. I was happy that the winner was from Kentucky. I mentioned my little town was famous on Monday the saga continues we made a Huff Post segment (its toward the end of the video) The clerks that are opposed to the decision asked the governor to hold a special session. He declined. People from both sides are protesting every day. There is something about rain that always makes me want to sleep. I just can't seem to keep my eyes open. I have gotten side tracked from my diet so to get back in the swing of things I've been baking snacks that I can take with me. Baked cheese chips are super quick. 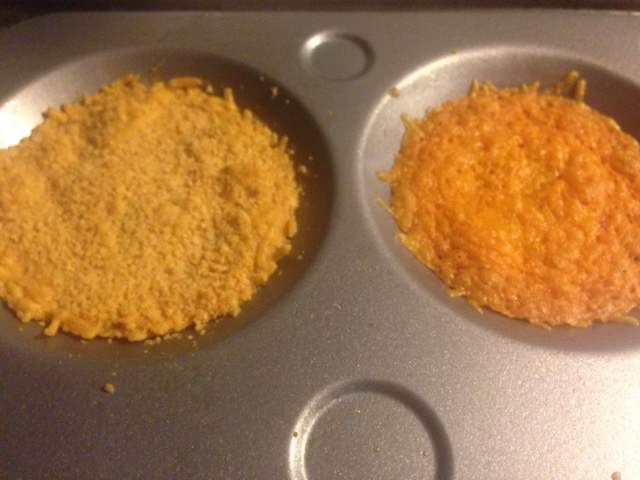 Preheat the oven to 300 in a shallow pan (I use a baking pan designed for muffin tops) sprinjle the cheese you want to use until it covers the bottom. 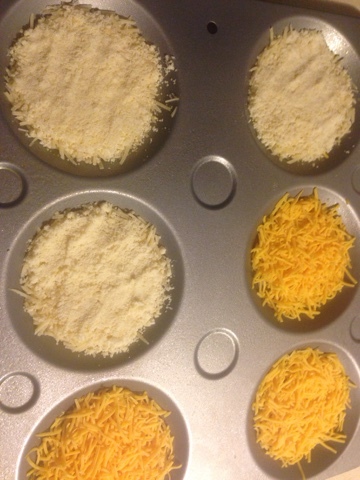 I used Parmesan (shredded and grated) and then I also used mild cheddar (shredded). Baked until melted about 10 minutes. Let it cool off and it should slide right off the pan. I'm really hoping for a dry weekend I really want to finish these projects before life gets crazy with school back in session. I really should learn to stay out of the comments sections of news articles. It does me no favors at all. I ALWAYS read the comments, because of the idiots. I love watching Ace Of Cakes. They make such awesome cakes. I know they are so talented. I bet working there is fun. Baked cheese chips sound amazing. Must try this immediately!